It’s easy to get weighed down by the admin of running a fitness and wellness club, from scheduling and class registration, right up to booking management, billing and marketing. If your club has been around for quite some time now, you’re most likely bogged down in excel sheets, pen and paper or an archaic system that no longer meets your needs. We don’t need to tell you how intense the industry is right now. With boutique fitness studios and specialised gyms popping up on every street corner, clubs need to seriously up their game if they wish to retain their current member base and overall, have a chance at staying relevant in the overall fitness sphere. Fortunately, new age software companies have acknowledged the changes in the industry, and subsequently built a product to meet the needs of the 21st century fitness consumer. With such software in place, you have the opportunity to manage your club from one integrated system with confidence; anytime, anywhere. That said, there are tons of club and club management software on the market today with varying capabilities, so it’s easy to get lost in the noise. Whether you’re looking for a lightweight software combined with a mobile app solution or a more complex software with fine tuned reporting capabilities, there are common characteristics that your chosen software should have. With this in mind, we’ve set out 6 key considerations when searching for a club management software that meets each of your facility’s requirements – without the need for compromises or workarounds. Be sure to keep these considerations in mind when carrying out a demo of your potential software! Consideration 1: Does the Software Provider Consider Mobile a Priority? Member Retention. One thing’s for sure – mobile booking is no longer seen as a “nice to have”, it’s expected. If you want to retain members, you need to prove you value their custom. By giving them more flexibility and convenience than your rivals have offered them, you can prevent members from slipping away further down the line. With such a system, you can also use mobile app engagement tools, such as push notifications and an in-app news feed, to engage members and drive class bookings even higher. Member Acquisition. What better way to impress prospective members than with a mobile app designed for your club’s unique brand? That’s right, your mobile app acts as a unique selling point over rivals gyms and studios who are yet to take advantage of the trend. By providing easy mobile booking and payments through your app, you’re telling members that you’re really trying to make their fitness regime more accessible. In such an overcrowded marketplace, this advantage could be just what you need to step ahead of the competition. When you improve the member experience, you increase the likelihood of generating high-quality renewals and referrals, the foundations of your growth plan. The ubiquitous use of mobile phones has spurred digital ad spending on mobile devices in the US which is expected to top $65.87 billion in 2019 (72% of total digital ad spend). Consideration 2: Does the Software Provider Integrate with Online Channels? It’s simple. Your software provider should enable you to maximise lead generation from online channels, whilst also giving your members the freedom to book a class when it suits them most, whether they’re surfing the web from their smartphone or desktop. When you integrate your club software with your website, you can create a “Website Portal” for members and potential members alike. From here, your website visitors can view your live schedule and purchase classes, courses or memberships directly from your website, depending on the software provider you opt for. The best part of a flexible website integration is that you can make changes to your timetable or membership options in the software and your Website portal will automatically update to reflect these changes, all saving you time in your hectic day. 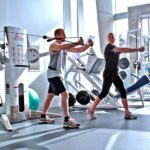 Your gym software provider should also give you the option to connect a similar online booking portal with your Facebook page. This gives you the opportunity to drive leads from the Facebook presence you’ve worked hard to create. Consideration 3: Will the chosen software provider make your life easier? One thing’s for sure, you need a gym management software that saves your time from manual, repetitive admin. The last thing you want to do is pick a software provider that doesn’t cater to your core needs, resulting in more admin than before. Will I need to implement workarounds to make this software work for my business? Is this software specialised in the fitness and wellness industry and thus have the features that are most relevant to my business? Will this software make my day and my members day run smoothly? Consideration 4: Does the chosen software provider give you room to grow and scale? Your club management software should give you the insights you need to grow and scale your business. If the software in question does not offer the key reporting features you need to grow your membership base, is it really the right fit for your business? Will the selected club software provider enable you to pull a report of this information in seconds? Consideration 5: Does the software make it easier to communicate with members? With competition as intense as it is, you need to be able to connect with your members anytime, anywhere. Fortunately, one of the greatest benefits of having a branded mobile app as part of your club software package lies in the direct marketing channel that it creates. Once a member downloads your app, they essentially carry it around with them every single day. You can quite literally create booking opportunities from the palm of your members hand. When combined with targeted push notifications sent directly from your app, you have the ability to encourage users to take action in real time. When it comes to building meaningful relationships, this works a lot better than an email which more than likely will go straight to their junk mail. Don’t settle for a complicated software that doesn’t meet your club’s needs. When you take these considerations into account and ask the right questions you can be sure to find a software provider that enables you to free your time from repetitive admin and grow your business.